Private apartment,balcony with sun all day, overlooking large, luxurious pay-in swimming pool with its own high quality restaurant and free sun beds. There is free shade and play areas.This is a haven for kids to play but is large enough for adults to have privacy away from the children if needed.There are many restaurants and bars and nightlife within easy walking distance from the apartment. There is a white sandy beach and sea approximately 3 minutes walk with many restaurants located at the beach.Apartment has private balcony for sun bathing and dining. Large living area and indoor dining if required along with full kitchen facilities including oven and hob and washing machine.Two bedrooms with one double bed and two single beds both with air conditioning.Living room could sleep two more people but not recommended during the heat of the summer. Bath, bidet and shower facilities.Private door and hall way entrance to apartment. Sunshine, privacy with access to night-life good restaurants, casino and sea sports. Easy access to area from two airports Alicante and Murcia.You can enjoy total privacy or you have many great activities for children without both conflicting. Gardens and grass areas are available for use and are well manicured. You can opt for quietness and solitude or have great fun with the family and children the choice is yours. My family learnt to swim here. Parking available at the apartment block if you hire a car but a car is not essential to enjoy the facilities. Convenient to private swimming pool and the sea which is a approximately 3 minutes walking distance from the apartment.Nominal entry charge to pool. The large terrace in the apartment gets the sun all day. Beach equipment available for use. Golf & Tennis and Aqua Park all available close to apartment and restaurants in abundance with excellent food.You can opt to relax and take life easy in quietness or enjoy the beach and the night-life within walking distance with water-sports on the beach. Casino close for those who like a flutter. One bathroom with shower and bath wc and bidet. Lounge, dining room TV music centre large sofa. Fridge/freezer microwave, hob/oven washing machine and all utensils. Large balcony for sun bathing and dining outdoor if required. See website - two golf courses located locally and La Manga golf/tennis/squash/horse-riding and other outdoor pursuits available approximately 50 minutes in car. Notes on accommodation: Comfortable double bed in master bedroom with two single beds in second bedrooms and in-built wardrobes in each bedroom. Outside: Apartment is located in private well manicured gardens and has its own private balcony that gets the sun all day and overlooks private swimming pool that apartment residence may use at a very small charge approximately the price of a deck-chair on the beach. The pool area is large with its own private restaurant. Cleaning / Towels / Linen / Maid service: Towels and linen are included and property is cleaned before every rental and guest leaving must pay for final clean approx £30 or 36 Euros. This payment must be made when final balance money is being paid before departure. the location is outstanding. but that is it. we have chosen this based on the location, close to sea etc. the swimming pool is 8 euro per person regardless of age. price in which you don't get anything ( sunbeds etc) so technically you need to stay in the queue up in the morning to get a sun bed. 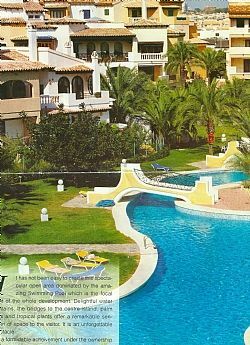 anyways..none of this was advertised as we would have chosen a different property with swimming pool as are loads to chose from in Torrevieja. so no swimming pool for my 7 yo son which he hated me for the entire period of holidays as I did not maintain my promises. obviously we couldn't afford 160 euro of swimming pool as obviously an adult needs to go in as well. so that was downfall. second thing . no air conditioned. there was one in each bedroom but did not work. when the owner was contacted ...we have been told to buy batteries.for the remote. a week later , I have found the complex keeper which eventually fixed the problem. as in gas loaded and the fans/filters were clean. the owner was extremely negative and non cooperative during the whole stay. so AC paid for ten days ...but none used. eventually when we had 2 days left to stay, the AC got fixed but the electric was going off when in use. so no AC. we did not stress anymore for 2 days. not easy with 35 Celsius but hey ho...it is the risk you take when you book with no warranty at all. now third issue. cleanliness...wow ..I mean wow. 2016 we aare talking about. people should not leave behind the linen used by the previous stayers. so..why going and relaxing in a bar or anywhere else..we had the lined washed instead....sorry for the sarcasm ...but seriously ..? so overall..amazing architecture ..amazing place to be...but the fact that swimming pool is payable, the AC and the cleanliness ..not a great stay. conclusion: nice place but the owner spoiled it. Alicante airport and Murcia airport are approximately 45 minutes drive in car from apartment.There is also a bus service all year round from Alicante airport to Torrevieja and from Torrevieja Bus Station to the airport cost approx €6-50 one way. Apartment is situated in town of Torrevieja and has many restaurants and bars although apartment is quiet and very private. The security breakage deposit will be returned to customer within two weeks and after management carry out final inspection . The £30 cleaning is to cover cleaning towels, linen and apartment when customer leaves Changeover Day: Preferred change-over date is Saturday. Notes on prices: There may be an extra charge if client is booking Christmas eve & day and New Years eve & day and Easter so request should be made at time of enquiry.